The Olympiastadion will provide the stage for two of this season’s surprise packages to end the year on a high note when high-flying Hertha Berlin host 1. 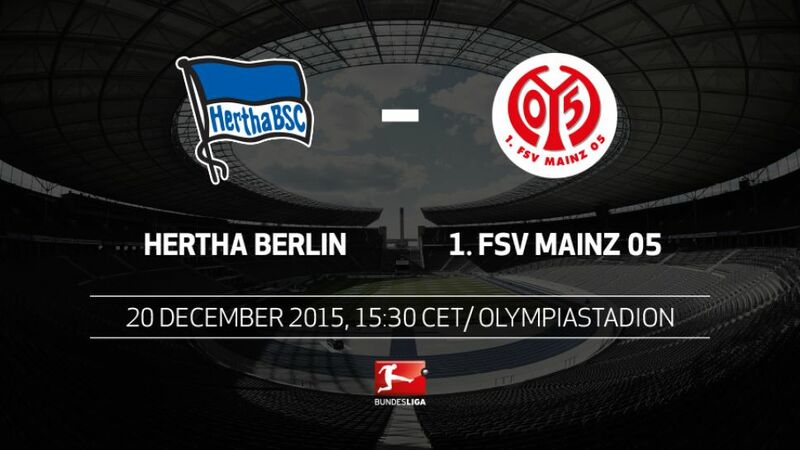 FSV Mainz 05 on Sunday (kick-off 15:30CET/14:30GMT). Mainz’s current tally of 24 points means they have already had the third-best first season half in club history. A victory in Berlin would make it the second-best.Hertha have already won as many games this season (nine) as they did in the entire 2014/15 campaign.The visitors are unbeaten in their last six consecutive league games (three wins, three draws) and have also not tasted defeat in their last four away fixtures.Mainz conceded 19 goals in their first 11 Bundesliga outings this season, but have let in just two in the five games since.Hertha’s Salomon Kalou (eight goals) and Vedad Ibisevic (six) are among the most clinical strikers in the league, averaging a goal every four shots.Mainz midfielder Yunus Malli has scored 14 goals in the 2015 calendar year - more than any other midfielder in the league.